How many times have your said to yourself you were going to do something once you got a ‘round tuit’. 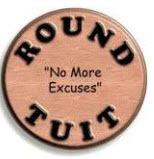 Here is a round tuit you can use every Monday... so there are no more excuses. Now you can think of each Monday as a January 1st. Rather than just having 1 time per year to set new healthy goals, you now have 52! An extra 51 reasons to focus on doing something healthy for yourself each MONDAY. Those of us who are caregivers know how challenging our roles are and how important it is to stay healthy – mentally, physically and emotionally. We talk to thousands of caregivers and hear words such as frantic, frazzled and frustrated. Below are 25 simple tips you can use to help keep yourself healthy. Begin your week on the right track. Determine how you’ll approach your caregiving tasks by breaking down each day into increments: what absolutely needs to be done now, what can wait, what can be done by someone else and what really does not have to get done. Arm yourself with knowledge. Learn about your loved one’s disease. Knowing will help you anticipate, understand and be ready for physical and emotional changes. Here is an excellent source of over 1,000 caregiver resources - all easily searchable. Call a helping hand. Everyone needs a little support sometimes! Make it known to your family members that you may need help at some point and that you expect family to pitch in. Keep in touch. Set aside an hour or so each Monday to connect with friends and family. Say hello or just shoot the breeze by phone, email, or by sending a tweet or posting on Facebook. caring for an elder, so revive your energy this week by grabbing 40 winks - or just lying down and relaxing - during the day when you can. Make quality time with your loved one. Sit with the person you’re caring for this week and look at photo albums, read together, or just talk about the “good old days”. This unhurried time together can be genuinely relaxing and rewarding for both of you. Pat yourself on the back. Give yourself the credit you deserve this week! End each day reminding yourself that you did everything you could for your loved one and that you’ll do your best again tomorrow. Move it Monday. Exercise helps recharge mind and muscle, so get moving for yourself and your loved one this week. Take a break from caregiving by making exercise part of your schedule: even a half hour of activity helps! Strike some balance. It can be difficult to balance your own needs with caring for your loved one, but minding your own health and well being will make you a better caregiver. Consider what you can do to put your health first this week. Restock Monday for health’s sake. Save yourself a headache by restocking your vitamins and medications at the start of the week. Have all your OTC, Rx medications and home health care supplies ready to go. This means less stressful days in the week ahead! A convenient option is to have home medical supplies delivered to your doorstep. Here is a resource for that. Don’t miss your regular check-ups. While it may seem that you just don’t have time to see your doctor or dentist, do your best to have regular check-ups. It will prevent problems down the line and ensure that you’re at your best. If it’s been a while, make an appointment this Monday. Keep laughter in your life. Have your “Me Time Monday” by seeing a funny movie, or reading a funny book. You can use Netflix, TiVo or your DVR to watch a movie on your schedule. Watch with a friend and laugh in good company. Make hobbies a habit. Love to sketch, bake, ride your bike or play an instrument? Be sure to fit your favorite activity into your Me Time schedule. It will help you recharge and stay positive. Have a veggie adventure. Fruits and vegetables are both delicious and healthy, so try to sneak more into your diet! Having a Meatless Monday is an easy way to start your week with the extra nutrients you need to care for yourself and others. Learn how to say time out. Constant caregiving can leave you feeling burned out, so listen to your body’s cues. If you’re feeling hungry, angry, weary or isolated, take the time you need for your own wellbeing. Consider scheduling some Monday Me Time as your weekly rejuvenation. Use respite care resources. Caring for a loved one who needs constant attention is hard work, so find a helping hand this week. Local short-term respite care services can offer the break you need to run errands or do something for yourself. One example is Visiting Angels. There are many other resources located here. Find time for favorite things. Schedule a weekly pampering activity like lunch with a friend, a haircut, massage, or trip to the movies – even an hour of indulgence can make you feel good and reduce stress. Make now, munch later. Make mealtime more enjoyable by cooking extra portions when you have the time and freezing them for later. Take the time you would have spent cooking and savor your favorite dish with music, candle light or a glass of wine. Keep a diary. Start your week by writing down your thoughts in your journal. Use this space to acknowledge your feelings and to plan your caregiving and personal activities. Use Monday to look back on the previous week, make changes, and acknowledge your hard work. Get technical. Learn how to use the internet to get and stay connected! There are many online resources for caregivers, including message boards, Facebook communities and Twitter feeds. Plugging in can help you get the advice and support you need, so start researching this week. Recommit to take care of yourself. When you find yourself breaking your promise to mind your health, renew your commitment. Use each and every Monday to focus on your goals to maintain the momentum you need to make real change. Slow and steady to lose weight. Being overweight can affect many aspects of your health, so check your BMI this Monday. If you need to lose weight, take it slowly. One to two lbs. per week is a healthy and sustainable weight loss goal. Be good to your heart. There are no visible symptoms of high cholesterol, and excess levels can lead to a heart attack – so know your numbers. Make an appointment to have your cholesterol checked this Monday. Make healthy headlines. This week, record your healthy activities in a journal. Then look back next Monday on everything you’ve accomplished and set goals for the following week. Do a Monday meet-up. Begin the week with a bit of fun! Pick an activity that you enjoy and find a group or club that shares your interest. Or simply chatting with another caregiver over a cup of tea of coffee can be relaxing. Please participate in our Caregiver Research here. Just two minutes of your time to help support this free and useful blog which contains no advertising so its unbiased and uncluttered.